STUDENT DRESS CODE LCA students are required to dress in accordance with the Llano Christian Academy Dress Code. The standardized dress code is intended to serve as a tool to create an atmosphere free from distraction. It serves to dispense with competition due to outward appearance and affluence; it de-emphasizes outward appearance in favor of inner beauty and character; it serves as an economic measure for parents; it enhances school spirit; and it allows students to demonstrate a submission to authority. LCA considers it the parents’ responsibility to assure that the student comes to school dressed in accordance with the LCA Dress Code. Violations of the Dress Code will be subject to progressive disciplinary action. Minor infractions and first time violations result in a written note or verbal request to the parents(s) asking for cooperation. In all disciplinary situations, LCA’ goal will be to gain parental cooperation in achieving compliance with the Dress Code. Students need to be fully dressed in proper school clothing when they arrive at school. For example, shirts tucked upon arrival. 1. Slacks, long shorts or blue jeans only; no designer type jeans are acceptable. 2. Leggings, stirrup pants, camo, or athletic clothing is not permitted. 3. Clothing should fit modestly and properly, not tight or baggy. 4. Clothing cannot be worn below the hips. 5. Clothing must be hemmed. 6. Clothing may not be frayed, torn or holey. 7. Belts must be worn if clothing has belt loops. brown, and black. If you have questions, ask the Administrator. should cover mid-section at all times. 10. No athletic T-shirts or jerseys are permitted. T-shirts with Christian logo are permitted. 11. Skirts and dresses must be no shorter than two (2) inches above top of knee. Sun- dresses are not permitted. 12. Blouses and shirts must be loose fitting; conservative in appearance and open no more than two (2) inches below neck. 13. Shoes are limited to our normal footwear policy. Roller type shoes are not allowed. Girls’ hair should be neatly groomed at all times. It should be worn in a manner that is not a distraction to the student or others around her. Color must be restricted to student’s natural color. Jewelry should be limited to a single pair of earrings, a singlenecklace, and a single ring for each hand. Single bracelets are acceptable. Girls’ nail polish and makeup should be tasteful, not calling attention to them. A student’s appearance should never be a distraction to the student or others around her. Boys’ hair should be neatly groomed and combed at all times. It should be worn in a manner that is not a distraction to the student or others around him. This includes Mohawks, ponytails or any extreme haircuts. Hair should be worn above the eyebrows in the front. Hair color must be restricted to student’s natural color. Jewelry should be limited to a small single link gold or silver chain with medallion(s) with a Christian theme, a single bracelet, and a single ring for each hand. Tennis shoes are recommended. Cowboy boots are allowed. No roller type tennis shoe allowed. No sandals, open heels or toes, high heels, slip-ons, flip-flops, or knee-high boots. All dress attire and regulations. Shorts must fit appropriately; not tight or baggy and cannot be worn below the hips. No designer shorts. If the event includes swimming, the swimwear must be one-piece bathing suits for girls and regular type trunks for boys. Speedo type swimwear is not permitted. T-shirts should be worn for both boys and girls if the group is swimming together. Footwear is limited to normal footwear policy. 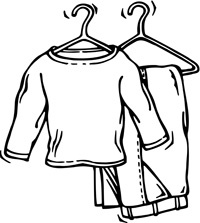 Because of the different types of event or activities, the Administration reserves the right to add or delete certain types of clothing, as it deems necessary and appropriate.